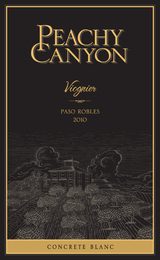 2010 Peachy Canyon Viognier "Concrete Blanc"
As the title of the wine depicts, the 2010 Peachy Canyon Viognier "Concrete Blanc" is actually aged in concrete tanks. The wine has a beautiful golden straw color and is composed of 100% Viognier. On the nose the wine shows generous aromas of white peach, orange blossom, acacia, vanilla, banana, and papaya. It's all that floral and tropical aroma that you would expect from the varietal.